In a massive cooperative effort, the Tree Blitz of 2017 has removed over 2000 standing dead trees that threatened to fall on the Little Miami State Park’s scenic trail. 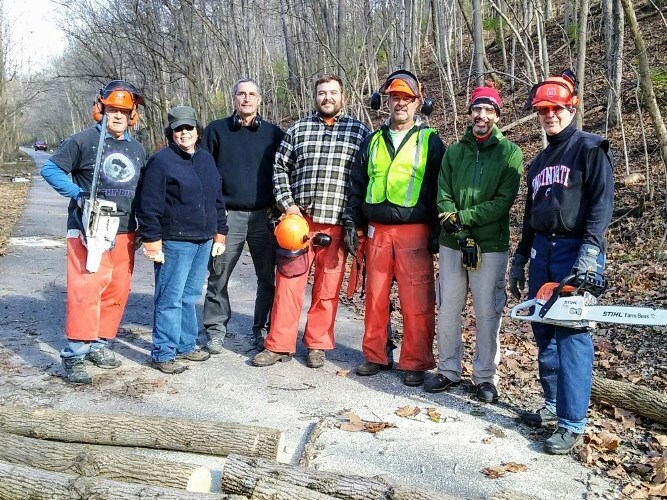 This joint effort of the Ohio Department of Natural Resources (ODNR) and the Friends of the Little Miami State Park (FLMSP) has significantly improved the safety and the beauty of our popular trail. 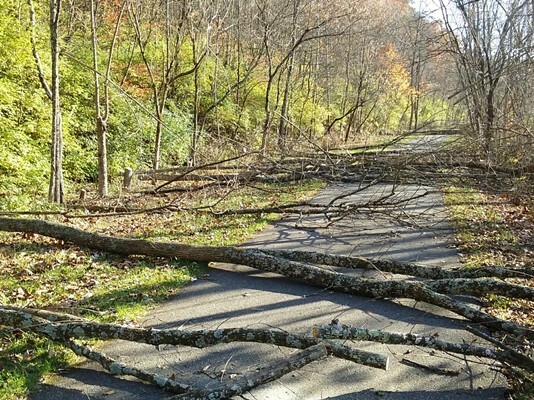 For 13 days in November, ODNR employees felled approximately 1250 dead trees between Corwin and Loveland while FLMSP volunteer crews followed to cut and remove the dead wood from the trail surface. State employees logged 350 hours and FLMSP racked up over 400 volunteer hours along this center section of our trail. 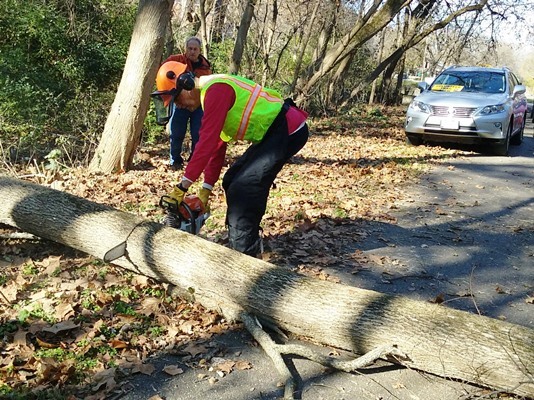 Then in December, state employees felled and cut hundreds more trees in the northern and southern sections of the trail, logging another 450 hours in one week. FLMSP volunteers cleaned up the trail behind the employees. Cleanup of branches in the berms will continue through the winter. The high number of dead trees is primarily due to the Emerald Ash Borer, an invasive beetle that entered Ohio in 2003. The borer’s larvae feed beneath the bark of ash trees, preventing the tree from moving water and nutrients. Once an ash tree is infested, it usually dies in less than five years. The Emerald Ash Borer has killed hundreds of millions of native ash trees throughout the eastern United States and southeastern Canada. Because these dead trees can fall at any time, ODNR urges caution around dead and dying ash trees. The removal of the dead trees has also cleared the way for planting over 700 new trees this year, FLMSP’s largest reforestation effort yet. These native trees are carefully selected to thrive in the trail’s river valley environment, and promise beauty for many years to come.